Ski lessons are available in Peisey-Vallandry and Les Arcs ski areas for every skill-level from children and beginners, to advanced and off-piste skiers. Whitebeam Chalets are delighted to have local ski instructor, JP, available for ski lessons in the Paradiski area. 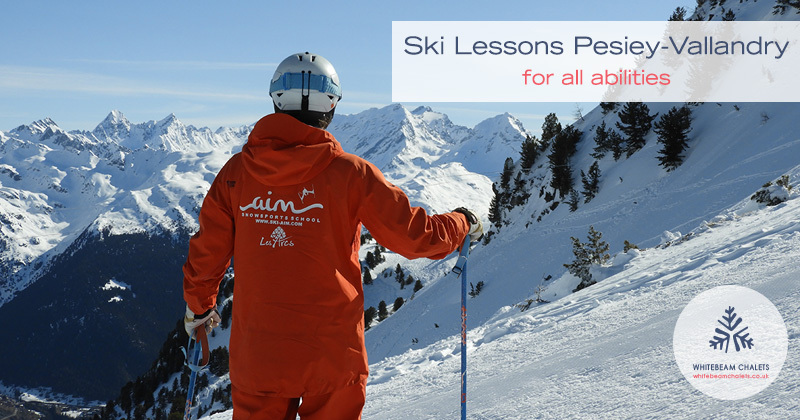 JP and his experienced team at AIM Snowsports provide high quality private ski and snowboard lessons as well as off-piste guiding and education. AIM Snowsports tailors ski lessons to the abilities of the students so they can achieve their goals; even the more advanced students can learn new skiing techniques! Private advanced ski lessons may be booked for a half-day (3 hours) starting at either 9:30am or 1:30pm and full-day lessons (6 hours) begin at 9:30am. Off-peak lessons are more affordable with prices often increasing by £31-£50 per lesson during peak periods (school holidays). One of AIM Snowsports’ more advanced ski courses is their Freeski Friday session. If you’re looking for an adventure, or for some fresh powder off-piste, this course runs for 2.5 hours on Fridays and includes off-piste education about safety, equipment, navigation, ski touring, and off-piste skiing. JP founded AIM Snowsports in 2015 and is passionate about helping people achieve their skiing ambitions through personal ski instruction. You’ll be in good hands with AIM Snowsports – their team of ski instructors have the highest qualifications available in the world including the Carte Professionnelle allowing them to teach in France. Each member of the team was personally hand-picked by JP and the quality of their ski lessons is well-reflected in their customer feedback – AIM Snowsports was awarded the Certificate of Excellence from TripAdvisor in 2017 and 2018. JP, how did you become a ski instructor? I started my training and teaching at my local dry ski slope in the UK. It quickly progressed from a hobby to a passion and I continued with my instructor qualification pathway as far as I could whilst still working full time in my previous profession. I decided to take a career break from financial services and spend a winter doing what I loved, teaching skiing, but planned to return back to London and my career. I had more success with my instructor qualifications during that winter gaining the level 3 qualification, recognised by the International Ski Instructor Association. That helped me decide that my future lay in ski instructing. I spent the following summer teaching skiing in Australia before returning to the Alps and pursuing the highest level qualification. After four more winters of training, exams, and ski racing I finally gained my BASI level 4 qualification. This allowed me to move to France which offers the best career potential for ski instructors. Why did you base yourself in the Peisey-Vallandry/Les Arcs area? Les Arcs is unique in that it offers direct access from a town (Bourg Saint Maurice) via a funicular railway. It’s also one of the best ski areas in the Alps with a huge amount of terrain offering a great teaching progression. Peisey-Vallandry is a ski instructor’s dream! The terrain is brilliant for teaching, and offers something for every level of skier, whilst providing shelter within its tree lined runs in even the worst of weather conditions. I wanted to offer something unique in Les Arcs and Peisey-Vallandry which didn’t exist beforehand. Tell us about private ski lessons in Peisey-Vallandry. How many to a group? Can we come as a family even if we’re different levels? AIM Snowsports offers private ski lessons to all ages and abilities. The private ski lesson is the best learning environment as the instructor designs the lesson entirely around the needs of the individual learner. When booking a private ski lesson for a group, it’s critical for us to consider the needs of everyone in the group. If the needs are too different, then of course the lesson is unlikely to meet the needs of each person. By keeping your group as close as possible in age, ability, and appetite for adventure, then everyone will enjoy and benefit more from the lesson. Your AIM Snowsports instructor will be able to adapt their teaching approach to the group, or help you decide how to divide your lesson time if needed. For families, kids and adults learn differently and have different needs so the instructor will adapt their approach to suit them all. In certain situations, adults and kids are best taught separately but this really depends on the circumstances. Learning to ski, and skiing in general, is a fantastic experience to enjoy together as a family. Our instructors will do their best to ensure you can enjoy your lesson altogether. What do your advanced ski lessons involve? Every private lesson is tailored to the individual. Typically an advanced skier will firstly want to check their technique on their piste and improve their abilities to edge and deflect their skis rather than sliding and slipping. More adventurous advanced skiers like to develop their skiing off-piste, on steep runs, bumpy runs, and any other terrain than the groomed pistes, to challenge their balance and skill further. As a general rule the instructor will assess the posture and balance of the skier before moving on to the fundamental skills involved in skilful skiing. Off-piste skiing is skiing anywhere except on the prepared groomed slopes of the resorts. The snow can be much more variable as well as the surface and terrain. It carries a greater risk and challenge in physical, technical, and psychological aspects. 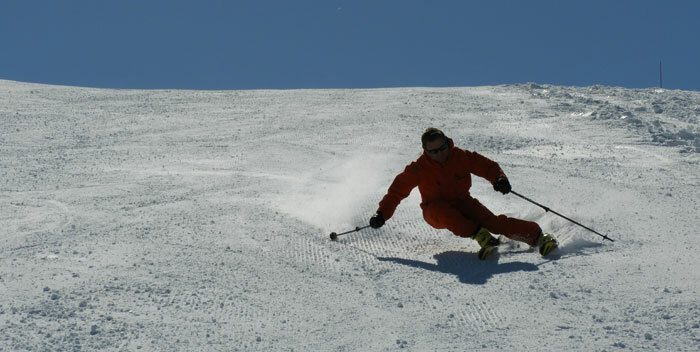 Skiing off-piste is the origin of skiing but with the evolution of slope grooming/piste preparation, and the spread of mass market skiing, off-piste skiing is now viewed as a more niche form of skiing. What do your off-piste skiing lessons in Peisey involve? Off-piste lessons can vary widely in content. Some skiers are simply looking to sample the off-piste – a heightened sensation to skiing on the piste. By using an instructor they are minimising their risk and increasing their chances of enjoyment. Others skiers are looking to develop their skills to be able to ski in a wider variety of conditions with the ability to ski any terrain or snow conditions being the ultimate goal. The most experienced skiers are looking for their instructor to take them to the most challenging places, or find the best snow conditions using their local knowledge and experience to minimise their risk and maximise their enjoyment. Where do the ski lessons in Peisey-Vallandry start from? AIM Snowsports lessons normally start from the bottom of the Vallandry chairlift outside Le Bistrot Savoyard restaurant. This gives quick access to the chairlift and the ideal teaching terrain for every level of skier. Do you do beginner ski lessons? We love beginner ski lessons! They typically start at the bottom of the chairlifts in each resort on the flattest terrain. Our teaching methodology promotes safety, enjoyment, and learning in a progressive and friendly manner. We feel we are privileged to introduce people to the wonder of skiing! How do you become a ski instructor in France? Whilst there has been lots of negative press historically about French protectionism, the modern pathway to become a ski instructor in France is very clearly defined. That doesn’t mean it’s easy! France demands that every instructor is fully qualified in order to work independently of a ski school. The alternative is to work within a French ski school as a trainee for a maximum of four years, after which time you are ejected. 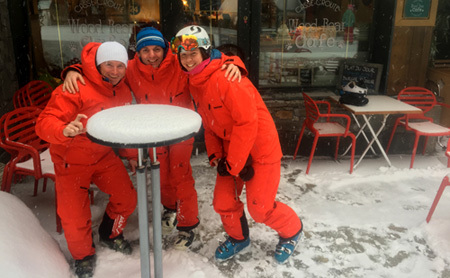 Many national snowsport instructor associations support a 3 or 4 tier qualification system. More details can be found at www.iasisnowsports.com or www.basi.org.uk but full qualification can take five years or more and many thousands of pounds in training fees, exam fees, travel, accommodation, and lift passes. Whitebeam Chalets cookbookWhat’s new at Paradiski this coming ski season?